Welcome to the TLC Book Tours stop for the latest book by Adina Grigore, author of Skin Cleanse and founder of S.W. Basics—Just the Essentials! Just the Essentials is a guide to using the restorative powers of essentials oils in your daily routine. I'm fairly familiar with essential oils and their many benefits and uses, and was taught to use them by my mom when I was younger. That said, while I often purchase natural, locally made health and beauty products, I've never really ventured into mixing up my own—at least not for beauty purposes. My hands-on experience consists mainly of natural for-the-home remedies (cleaners, pest control, etc) and aromatherapy (stress relief, cold relief). Just the essentials does talk about these things (like Grease Cleaner, Aromatic Dryer Sheets, Lemon-Pine Furniture Polish, Lavender-Eucalyptus Dish Soap or Headache Blend and Motion Sickness/I-Gotta-Barf Blend), but it also includes beauty projects like Non-Greasy Beard Oil, Rosemary Clarifying Shampoo, Rose-Chamomile Conditioning Rinse. Chapter 5 But What Do I Do with Them? I think it's a great book for beginners, since that first part includes the and what-why-how and some history to back it up. I also think it's great that it includes some very simple and doable projects for the beginner in the DIY chapter. As in any field, I definitely recommend that it's not your ONLY book on essential oils and how to use them, but rather one in a set of works and guides that you can reference and learn from if you're interested in DIY products, essential oils, naturopathy, health, alternative medicine, and/or natural healing. 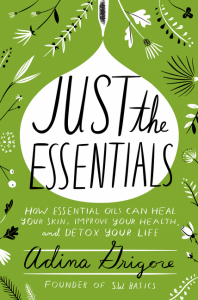 teaser: The author of Skin Cleanse returns with a comprehensive guide to the ultimate ingredient for living an all-natural, plant-based lifestyle: essential oils. But in modern times, they’ve often been misunderstood, underappreciated, even cast as "dangerous"—and relegated to the dusty shelves of health food stores. That is, until recently. Today they’re back in the spotlight as increasing numbers of consumers are looking for all-natural alternatives to skincare products and opting for fragrance-free detergents and soaps, natural remedies for common ailments, and toxin-free home cleaning solutions. 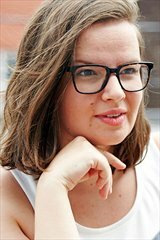 about the author: Adina Grigore is the founder and CEO of the all-natural, sustainable skin-care line S.W. Basics, which she started out of her kitchen in 2011. A graduate of the Institute for Integrative Nutrition, Adina has worked in the wellness industry since 2007 as a private holistic nutritionist, a personal trainer, and a workshop coordinator teaching people about the DIY nature of wellness. S.W. Basics products are now sold internationally and have been featured in Vogue, O Magazine, W Magazine, the New York Times, InStyle, Real Simple, and Martha Stewart Living, among others.